The 2016 Sound of Dragon Music Festival’s call-for-scores has closed. We have received 30 cross-cultural compositions submitted from composers in 12 countries. Some of the works will be performed in a featured concert at the 2016 festival. Some pieces will be scheduled for performance in 2017. Thank you for taking part in our first call-for-scores. Composers of any age and nationality can submit. There is no submission fee. Available Chinese instruments – erhu/gaohu/zhonghu (1 player), erhu/vocal (1 player), dizi/xiao (1 player), zhongruan/daruan (1 player); western instruments – flute/alto flute/bass flute/piccolo (1 player), cello (1 player), classical guitar(1 player). 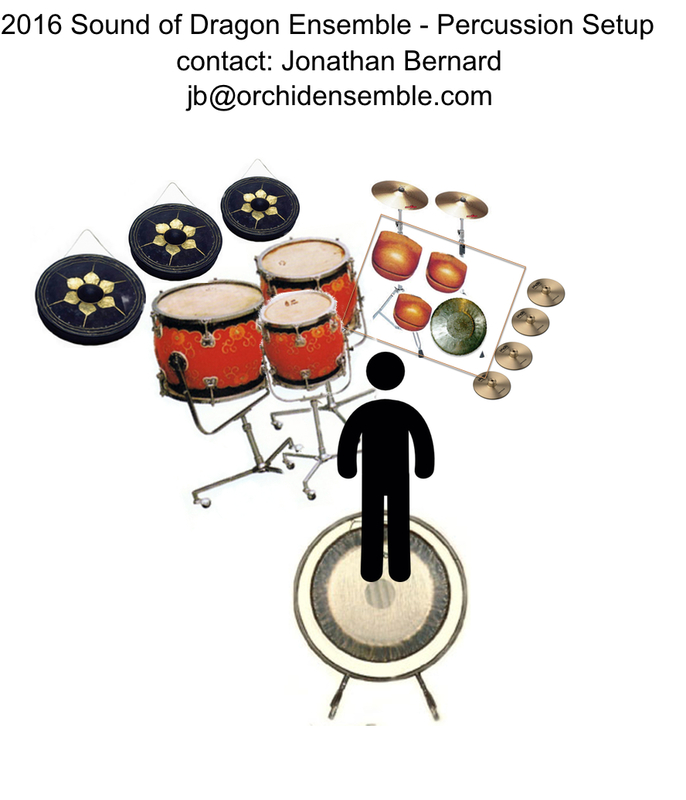 Please refer to the percussion list to see available percussion instruments (1 player). Must include at least one Chinese and one western instrument. The works do not need to be newly written, but priority will be given to pieces not yet performed in Vancouver and on combinations of instruments not often seen. Please keep in mind that each piece may have limited rehearsal time. Score – only electronic scores created on computers as PDF will be accepted. Except for graphic scores, hand written scores will NOT be accepted. Recording (optional, but recommended)– audio or video recordings of the piece as wave, mp3, or mp4 files. It can be live performance, studio recording, or midi realization. Youtube or soundcloud or website links are also acceptable. Short program note (one paragraph) & short bio of the composer (max. 250 words) in English and Chinese, or at least one of these two languages, submitted in one doc file. Selection will be announced on Jan 30, 2016 at soundofdragon.com and by email. The Sound of Dragon Society reserves the right to choose pieces to balance the types of works in the programming and to showcase different instrumentations. The performance at the festival will be recorded, and the recording will be shared between the society and the composers for archival and promotional purposes. Although not guaranteed, works not selected for the 2016 festival may be programmed in the 2017 season. Composers of the selected pieces are required to mail to the society one printed copy of the scores, which will be kept by the society and not returned to the composers. Composers are responsible to prepare all the parts. Parts should be generated electronically on computers and submitted as PDF files. Except for graphic scores, hand written parts will NOT be accepted. The Sound of Dragon Society reserves the right to withdraw a piece if the requirements for the parts are not met. Local composers should attend at least one rehearsal of their pieces. Out of town composers may be sent recordings of the rehearsals for comments. Performance: between April 22-24, 2016 at the Sound of Dragon Music Festival at the Roundhouse’s Performance Centre in Vancouver. The composers whose works are chosen will be given full festival passes for the weekend. Admission to the concerts, other than the Sound of Dragon Ensemble, are first come first served. Out of town composers are responsible for their own transportation and accommodation. Sound of Dragon Society will send invitation letters to composers who need to apply for their own travel funding. 2 suspended cymbals (choice of standard dark, standard brighter, Chinese cymbal with strong D fundamental ‘pitch’, and splash cymbal) – one on the left above the toms; one on the right above the temple blocks. In order to provide the resources for composers unfamiliar with these instruments, the Sound of Dragon Society presented a series of workshops in October & November 2015. The materials and videos for the workshops are now on the Sound of Dragon website for future references and continuous studies. Please click on the instruments below for the links to the presentations.